The anti-Semitic miniseries Horseman Without A Horse, is back on Egyptian television. The 41-part series, which first appeared on Egyptian state television and other networks across the Middle East during Ramadan in 2002, is scheduled to be broadcast on Al-Tahrir TV. The series features the virulently anti-Semitic forgery “Protocols of the Learned Elders of Zion,” which has been used through the last century as an excuse to scapegoat and persecute Jews, as a major plot device. The program, replete with gross anti-Semitic accusations and depictions, tells the story of scheming Jews, who in a bid to dominate Israel, the Middle East and the world, make efforts to hide the existence of the “book” [The Protocols], which would reveal their conspiracy. 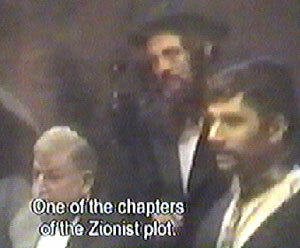 Following the original broadcast of the miniseries, governments around the world spoke out to condemn it. While the Egyptian government did not officially comment on the program, its broadcast did provoke a discussion in the Egyptian media on the line between anti-Semitism and criticism of Israel. Most notably, Osama El-Baz, a top political advisor to then-President Hosni Mubarak, condemned Egyptian anti-Semitism and Holocaust denial (while still vehemently criticizing Israel) in a series of articles in Egypt’s leading newspaper Al-Ahram. Will government, political, religious and social leaders in post-revolutionary Egypt stand up and condemn the age-old demonization of Jews now appearing on Al-Tahrir TV?